Who are you to pass judgment on the servant of another? It is before his own master that he stands or falls. And he will be upheld, for the Lord is able to make him stand. (Romans 14:4 ESV) This is not a call for us to unlovingly disconnect from others. The challenge is to not be unloving and judgmental about non-essential, extra-biblical practices of abstaining or partaking in certain things like food, drink, special days and practices. We are not living in the day of judgment. There is coming a day of judgment, but you and I will not be seated on the judgment platform; we will all stand before it. See Romans 14:10-12. For the one in Christ, this is not a judgment of wrath and condemnation. It is a judgment of every moment of every day of the believer’s life by God. A Christian is not judged in our sin because the judgment of our sin took place on the cross of Calvary by Jesus (Ephesians 1:7). There are two judgments before God to come. Christians are not saved by their works, but their works show evidence of their salvation just as the works of the unsaved give evidence of their spiritual death. In God’s grace, he is tabulating every opportunity to reward his followers for the things done in this body. This is our great motivation to lovingly live out God’s command to not pass judgment on other Christians. The measure of the future judgment is directly linked to the way we judge people today. We exercise love, forgiveness, generosity, mercy and the like out of that which has been given to us. 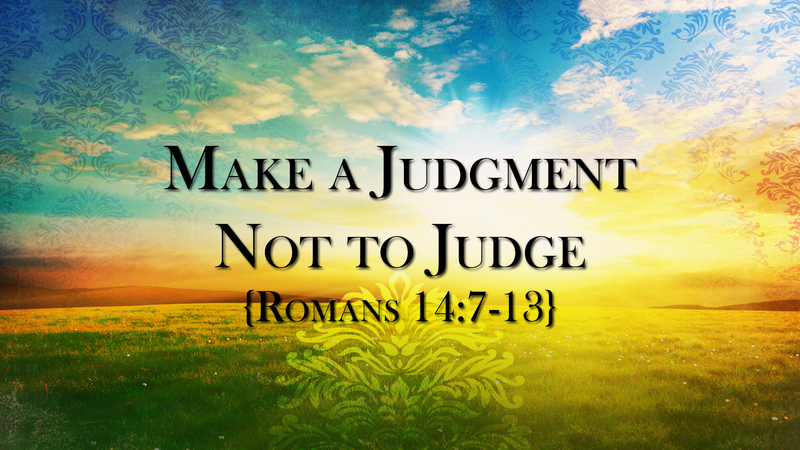 The measure of judgment we use towards others is directly related to the measure that we will experience before the Lord’s judgment seat. With the records of our Christian life before him, Jesus will test our motives, our methods, our purposes and our faith. Those things that are not sourced and expressed in the love of God and in faith in him will not pass the test and thus be burned away. Two groups who are at risk of living judgmentally: The abstainer and the partaker, the immature and mature. Make a judgment to lovingly help people rather than being a hindrance to them. 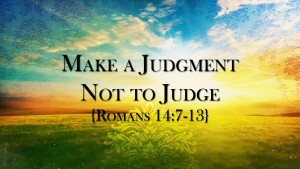 If we judge anything let it be that we judge our lives to never be a stumbling block or hindrance to one of our own.